1. She has become a media sensation. Cox has become an unofficial voice for the trans movement, which has gained more traction in the media than ever before. TIME readers voted for Cox over Justin Bieber in the TIME 100 reader poll. However, even with over 88,000 votes Time left Cox off its 100 Most influential list outraging fans. With Trans* icons Amanda Lepore and Carmen Carrera at The Blonds Fall '14 show. Sweeping major LGBT acting/advocate awards. Promoting the second season of the Netflix smash "Orange is the New Black"
At a recent promo event for her hit Netflix show. Announcing her own docu-series with MTV and LOGO called Trans Teen. The one-hour documentray following the lives of trans* teens ages 14-24 premieres simultaneously on both networks this fall. 2. She travels the country speaking about everything from Hollywood,social/political justice, to fashion. Her message of strength and poise is one Vogue readers would read in a heart beat. 3. She would bring some much needed diversity to Vogue's covers. Vogue has often come under fire for the lack of diversity amongst its coverstars. a prominent LGBT figure has yet to grace the cover. 4. Vogue loves exclusivity with its coverstars. Vogue loves introducing a new cover star to the masses. With Cox starting to appear on more publications it would be a great get for Vogue to be the first major fashion monthly she covers . 5. The legion of "Orange is the New Black" fans would flock to the news stands for the issue. Cox posing with a fan. 6 She serves FACE for the Gods. 7. She was made to be in front of a camera. "Oh the dress code was black? OOPS!" "Girl this hair a mess"
Laverne looks incredible in whatever she wears. "I know...my body is SNATCHED"
"This is how I do casual"
Do the right thing Vogue and give the woman a cover! Until then you can catch Laverne Cox as Sophia on the season two premiere of "Orange is the New Black," Friday, June 6th only on Netflix. The day after this was published TIME made up for excluding Laverne off its 100 Most Influential List by giving her a cover all her own. 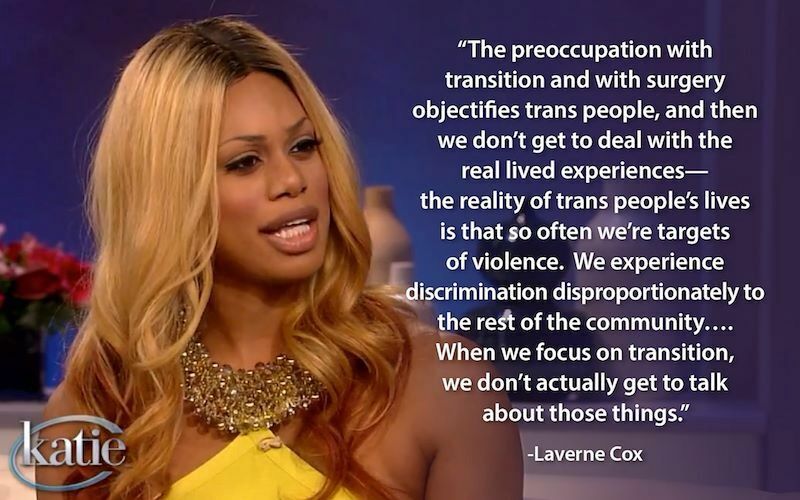 This is truly Laverne's time!! !